Vantec ION2 PCSTATS Review - More details about the iON2! 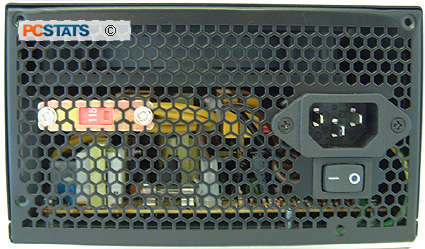 Abstract: Considering all the junk power supplies offered with computer cases these days, finding a power supply that's right for your system requirements can be quite a challenge. More details about the iON2! I must have said this a thousand times before, but you can usually tell how much confidence a manufacturer has in its product by the length of the warranty. In the computer industry three years is a virtual eternity, and it should show you that Vantec thinks highly of their iON2 power supply units. There's no reason why you'd ever want to open the power supply but if you do please keep in mind that it voids any warranty you might have. 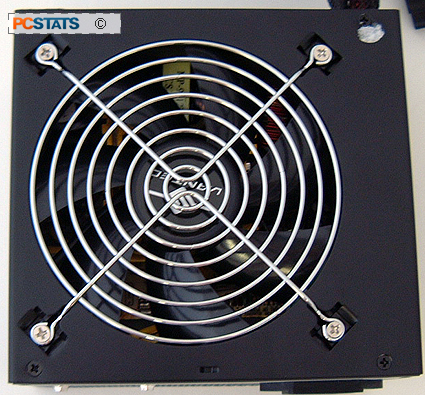 Now that we've gotten that out of the way, when we opened up the iON2 we noticed that the 120mm fan is replaceable. If the fan starts to die or make a lot of noise simply replace it with something else! The rear of the ION2 just has the 115V/220V selector, plug socket, and power button. Once inside we quickly discover that the Vantec iON2 power supply is actually built by Macron Power, but that's not a big deal as most companies contract out production to OEMs. Inside the case on the right hand side we see two rather large 820 microfarad 200V capacitors, but other than that everything else is pretty plain. If the fuse should blow, it's nice to know that it is potentially replaceable. Too bad opening up the case to replace it voids the warranty, but it does give users an option should the power supply die. 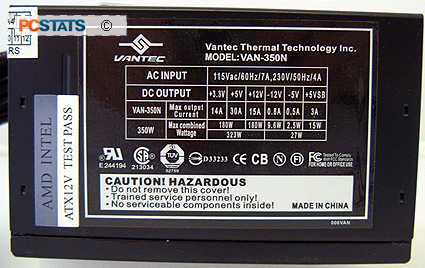 Most manufacturers state their peak values on the information label on the side of the power supply. I suppose this is because they are often quite a bit more impressive than what the power supply can deliver sustained. Vantec list exactly what the power supply can deliver for a prolonged period of time, not just what it can do in short microsecond bursts. Pg 2. — More details about the iON2!